Regular trips to your dentist are a key part of dental care, but even more important is how you care for your smile between check-ups. The Marsfield Dental Care team recommends the following to keep your smile in tip-top shape for the next time you’re booked in for an appointment. A regular brushing regimen forms a central part of any oral hygiene program. Commit to brushing twice a day, and use a fluoridated toothpaste to help protect your teeth. Brush using a circular motion, and ensure that hard-to-reach areas, including molars and the gum-line, are covered. Too many people remember to floss only if they have something stuck between their teeth. 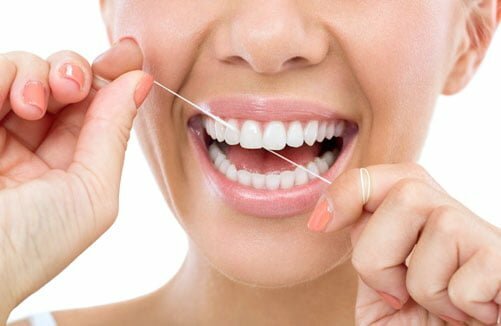 However, regular flossing can remove smaller particles and help prevent the build-up of plaque between the teeth, potentially preventing cavities and keeping the gums healthy. Worn toothbrushes aren’t as effective as new ones, so if yours is showing signs of wear and tear, be sure to replace it. Typically you’ll need to do so every two or three months, or whenever the bristles start to splay. Sugary, carbonated and acidic beverages can affect pH levels in the mouth, and can also cause damage to tooth enamel over time. Minimise soft drinks and mixed drinks, and hydrate with plain water instead. Smoking is extremely damaging to the overall health of the mouth, including teeth and gums. To reduce the risk of gum disease, it’s highly recommended that you quit smoking if you’re a regular smoker – or avoid smoking in social situations if you’re a social smoker. Water can help neutralise acidity after meals, helping to protect your teeth and keep your mouth healthy. Similarly, chewing gum can help stimulate the flow of saliva, which itself can be effective in promoting a healthy mouth. If you begin to feel sensitivity in a tooth, or you damage a tooth between visits, don’t wait until it’s time for your check-up to do something about it. Getting in early can help you get on top of a problem before it becomes a larger issue – a small filling is a much less intensive solution than a tooth extraction. If you’re looking for a dentist in Sydney our friendly and skilled Ryde dental care team is always happy to help answer any questions you might have about your dental hygiene, and keep your smile healthy. Thank you for sharing tips for oral hygiene. I did not realize that water can neutralize acidity after meals. Drinking more water when I eat is something I should definitely try to help keep my mouth more healthy. It’s been I while since my last visit to the dentist, so I think I should set up an appointment. Thank yo sharing tips which are quite impressive to read and very informational.